Welcome to Week 3 of the 5 week Getting Started Bento Challenge! A quick reminder of the outline of this and upcoming Challenge weeks. In Week 1  we focused on getting organized for making bentos on a regular basic - the very basics. And in Week 2  the focus was on healthier bentos. For me, the no. 1 reason I like to make bento lunches is that it allows me to eat healthier. But just behind at no. 2 is to save money, especially in these uncertain economic times. I happen to live in a place where any kind of prepared food is either expensive or unhealthy, and sometimes both. So by the very fact that I do make bentos for myself and The Guy, we are saving a lot on our food expenses, without sacrificing the quality of our food. Still, there are things you can do to lower the cost of your bentos, not to mention your whole food budget, without compromising on quality. This is the most obvious money saving tactic of course. If you can set aside a little of your evening meal and add a bit to it, you can basically assemble your lunch for almost no additional cost. If you don’t like eating the same thing two days in a row though, think about ways in which you could use the same ingredients and give them a different flavor. For example if you make a spaghetti bolognese for dinner, you could set aside some of the sautéed meat and onions etc. to make meat soboro . If you make egg salad, you could reserve a couple for soy sauce eggs  or easy lazy tea eggs . There are a lot more ideas on re-purposing leftovers on this page . I keep on harping on this point, but planning your meals ahead can really help to cut down on one of the biggest money-wasters, buying too much food and seeing it go bad. For instance, last week  I bought a head of broccoli. I used the florets for two bentos and the stemps in a kinpira . I used to let broccoli get limp or moldy all the time, but am getting better at using it up! Planning helps me to use up fresh vegetables, fruit and other things before they go bad. The best way to save your food for later use is to freeze it. You can make things specially for freezing, or just make extra of whatever it is you’re cooking and freeze the surplus in individual portions. You can also freeze leftovers and things to use some time down the line. Preserving is another thing to consider, if you’re up to it. 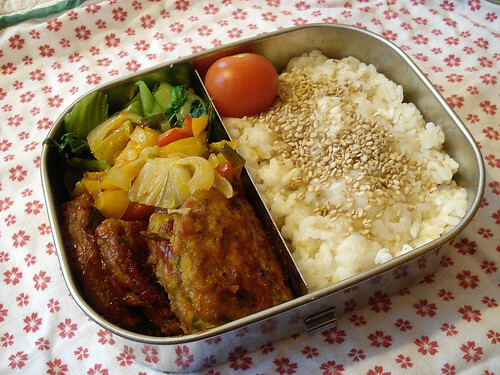 Things like pickles can be very useful bento space fillers. Preserving is a big subject so I’ll leave it at that for the moment. Take a look at the Johbisai (food stash)  section of the site for recipes that are particularly suited to ‘stashing’, in the freezer or in your pantry. Stick to vegetables and fruit that are in season, when they are usually the cheapest and the best. Asparagus and strawberries in the dead of winter is a waste in so many ways. Unless you are splurging on expensive Japanese (or other) ingredients, vegetarian ingredients are often cheaper than their meaty counterparts, not to mention healthier. So if you can stand the idea of a meatless meal once or twice a week, see if you can put together a meatless bento that costs less than a meat-loaded one. By no means am I saying that everyone should stop eating out. I love going to good restaurants myself. But my reason for going to a restaurant is not really for sustenance. (When I do the household budget, I categorize restaurant meals under ‘entertainment’, not ‘food’.) It’s to have a good time - to try out new dishes and wines, enjoy the ambience, and of course to have a good chat with my friends. If you have the time and money to do this every day for lunch, you are probably not reading this anyway! I’d rather save up by making bentos most of the time, and splurge (entertainment wise and calorie-wise) once in a while. That was a long preamble! Here are this week’s tasks. If you are finding the challenge is getting a bit overwhelming, slow down! 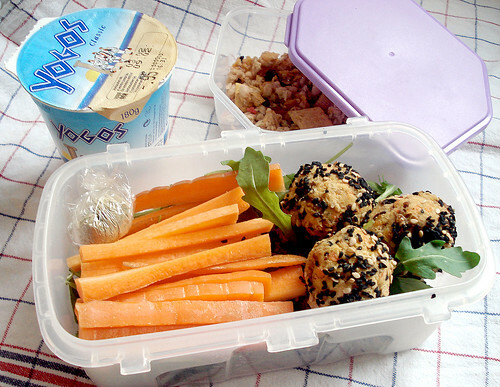 Just concentrate on making a bento at least once or twice a week - more if you can manage it. As you feel comfortable, try the Week 2  ‘healthier bento makeover’ tasks, and continue to try to get organized enough to make bentos part of your everyday routine. Start or continue planning your bento meals! Not only does it keep you organized, it can help save money be reducing waste. Play a little game with yourself, and see how many bento items you can create by not buying anything extra over what you buy and make for dinner. Check out the prices you pay when buying a normal lunch (sandwiches or takeout salad or hamburgers or whatever). Compare how much you are, or can, save by having a bento lunch instead. If losing weight is one of your Challenge goals, continue to work on the tasks laid out in Week 2 , especially measuring portions accurately and aiming for good balance. Oh, and keep up the exercise too! You might also consider putting together at least one vegetarian lunch, relying on vegetable proteins like beans, whole grains, nuts and so on. You might find that it’s lower in calories, more satisfying, and cheaper than a meat or cheese-based bento! Basic: Don’t give up! Just concentrate on making at least a couple of bentos this week if you’re feeling overwhelmed. Going Deeper: Try cutting the cost of your bentos without sacrificing quality. 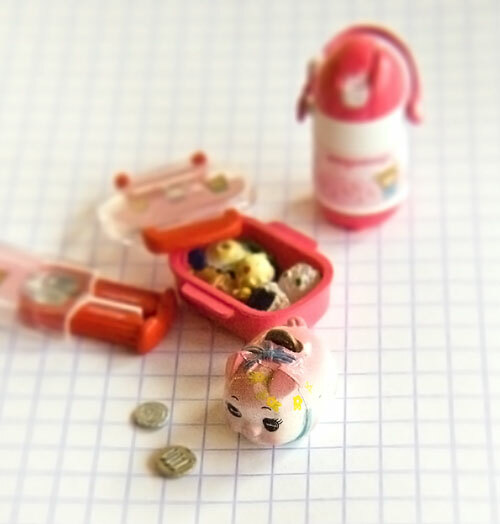 Calculate how much money you’re saving just by bringing bentos for lunch! 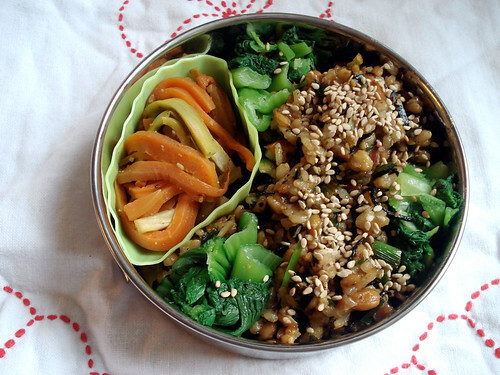 Weight Loss: Continue on from Week 2; consider vegetarian bentos. This might be the toughest week to get through. Don’t give up, just do what you can at your own pace! My Challenge Week 3  in a nutshell: Did pretty well, but exercise remains an issue. Spring couldn't come fast enough for me! This week, I focused on trying to make budget bentos by making all of my bentos vegan or vegetarian. 4 out of the 5 bentos were indeed vegan. As a rough estimate, none of them cost more than 2 CHF (about US $2) per bento, despite the fact that I used a premiums brown rice, and expensive-for-me Japanese ingredients like natto and kouya dofu (free-dried tofu). The exception was Friday's 'bento' (more like an extended snack ^_^), which was not vegan. 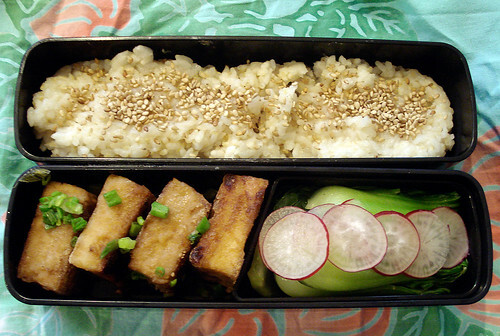 Thursday's bento also has an item made with kouya dofu (mixed with regular tofu). I'll post this recipe shortly too. 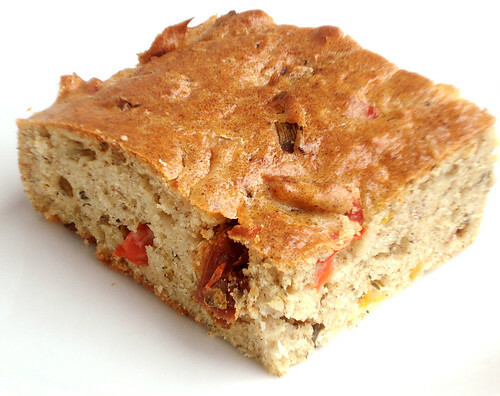 Friday's 'bento' - well, what happened is that I got a sudden Urge To Bake Now around midnight, and made this savory cake. For lunch I just cut myself a piece, then another piece, etc... I ate about 4 pieces, which is 400 calories right there. It was so good, and very filling too. Because this has cheese and other not-cheap ingredients in it like pesto and sundried tomatoes, I think my lunch cost was around 3 CHF (around $3 US). Still a lot better than a storebought sandwich! I am still having trouble exercising regularly. This week I only attempted it twice! I just do not seem to be taking well to indoor exercise...or it could be that I'm just bored with the WiiFit. (But I can't do any exercise DVDs at the moment since I've packed them away already, ready for the move!) I really can't wait for warmer weather when I can plug my iPod earphones into my ears and go for a nice long walk. On the other hand, packing for the Big Move may be giving me some exercise of the weight-lifting kind. Still, I lost another 1/2 kilo / 1 lb or so. Overall I think it was a successful week. How was your week? Come and share with other Challengers in the forum !